The once-renowned Salander-O’Reilly Galleries imploded around 2007 after a number of customers and business partners sued owner and art dealer Lawrence B. Salander for allegedly defrauding them. By the end of 2007, Salander had filed for bankruptcy; by 2010, he was serving a prison term for grand larceny. The legal fallout from his story, however, continues today—as illustrated by a recent court decision. This case reminds those who buy and sell art that diligence is paramount—no matter how trusted the seller, and no matter how savvy the buyer. In 2004, Salander and professional tennis legend John McEnroe decided to become equal partners in the purchase of two paintings by Arshile Gorky, Pirate I and Pirate II. Salander bought the paintings at auction in the name of his gallery for $4 million, with McEnroe chipping in a $2 million share. McEnroe kept Pirate I and Salander kept Pirate II. Unbeknownst to McEnroe, however, Salander had also cut a deal with Washington real-estate developer Morton Bender, regarding the same works; Bender advanced Salander $4.3 million to cover the entire purchase price (part as Bender’s share and partly as a loan to Salander for his share). In 2006, without the knowledge of either McEnroe or Bender, Salander negotiated a deal with his longtime associate and customer, art dealer Joseph Carroll, whereby Salander would trade Pirate II to Carroll in exchange for two other works. Salander asked Carroll to draw up the invoice to reflect that the swap was being done for the benefit of Salander’s children through a foundation called “The Seven Salander Children Group.” Carroll initially questioned this, but eventually dropped the inquiry; in fact, the Group did not exist. 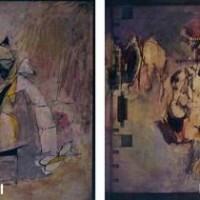 In the swap, Carroll received no proof that the Group owned the painting, nor any documentation about who currently owned it. A short time later, Carroll and Salander also executed another swap involving one of the same paintings that Carroll had traded to get Pirate II. Both swap deals had buyback options which were never exercised. In 2007, McEnroe got wind that Carroll was claiming ownership of Pirate II. To avoid litigation, McEnroe told Salander that he would drop any claim to Pirate II if Salander would release his share of Pirate I, of which McEnroe still had possession. Salander agreed. In 2008, however, McEnroe was informed that Bender had placed a lien on Pirate I. Eventually, McEnroe and Bender settled their claims against each other, and instead banded together to sue Carroll, seeking a declaratory judgment that they, not Carroll, rightfully owned Pirate II. Carroll counterclaimed, arguing that he was the true owner because the plaintiffs were bound by Salander’s actions and Carroll’s title was valid under the Uniform Commercial Code. The court held that Salander’s partners in the paintings (McEnroe and Bender) were not bound by his later transactions with Carroll because under partnership law, “an act of a partner which is not apparently for the carrying on of the business of the partnership in the usual way” does not bind the partnership. In this case, Salander was not acting in his capacity as a partner of either McEnroe or Bender; rather, he expressly told Carroll he was acting on behalf of the purported Group to benefit his children. Even though the Group turned out to be a fiction, Salander was not acting on behalf of either of his partners, Bender or McEnroe, and thus those partners were not bound by his later sale to Carroll. Carroll also argued that, under the U.C.C., when someone entrusts goods to a dealer of that type of goods, such entrustment gives the dealer power to transfer the entruster’s rights to a “buyer in the ordinary course of business.” Thus, Carroll reasoned, the plaintiffs in this case had entrusted the work to Salander, a dealer, who then conferred good title to Carroll. However, the court held that the U.C.C. did not protect Carroll, because when art dealers act as purchasers (as Carroll did here), they must observe “reasonable commercial standards of fair dealing in the trade.” Under New York law, a merchant purchaser such as Carroll thus may have a duty to inquire about the provenance or ownership of goods, particularly if there are “warning signs” such as a below-market price or a sales procedure that departs from those used in previous transactions. An art dealer who buys a work without making adequate inquiry may not qualify as a “buyer in the ordinary course” whose title is protected under the U.C.C. Here, the court pointed out that the values of the paintings involved in the various trades and buyback arrangements between Salander and Carroll should have raised questions. The parties had engaged in a “battle of the experts” over these values during the litigation, but the court concluded that, based on expert testimony, some of the terms of the swaps and buy-backs did not make economic sense, and should have alerted Carroll, as a sophisticated dealer himself, that something was not right. This was particularly true in light of the fact that Salander asked Carroll to buy Pirate II from this purported Group—a departure from his previous dealings with Carroll. Yet Carroll sought no proof of the Group’s existence, and no paperwork regarding its ownership of the work (even though Carroll had been present at the auction at which Salander purchased Pirate II). The court also pointed out that the provenance statement Salander provided to Carroll did not list the Group as the current owner (indeed, it did not list the current owner at all); Carroll had argued that this was not unusual, as provenance statements often do not list the current owner, but the court was unpersuaded, noting that Carroll’s own provenance statements listed himself as the current owner, and documents from past transactions between Carroll and Salander had included the current owner. The court concluded that, because Carroll had gone forward with the transaction despite these various red flags, he had not observed the reasonable commercial standards of the art trade and did not qualify as a buyer in the ordinary course of business. The court concluded that McEnroe and Bender were entitled to a declaration that their title to Pirate II was superior to Carroll’s. Even in the historically opaque, few-questions-asked arena of art sales, courts are insisting that parties take responsibility for “doing their homework” in advance of a transaction, and following up on anything that seems incomplete or out of the ordinary—whether that means a “too good to be true” price, paperwork that omits key facts, or an unusual structure to the deal. In 2006, when he acquired Pirate II from Salander, Carroll had known Salander for 15 years and had bought over a hundred works from him. That long history, however, did not protect him from Salander’s double-dealing—and did not protect him in court when his title was challenged by other victims of Salander’s schemes.